"Unification" is a two-part episode of the syndicated American science fiction television series Star Trek: The Next Generation, from the fifth season, which features Leonard Nimoy as Spock. It earned a 15.4 household Nielsen rating, drawing over 25 million viewers, making it one of the most watched episodes in all seven seasons of The Next Generation's run. Hearing that legendary Starfleet officer Spock may have defected to the Romulan Empire, Picard travels to Vulcan to talk to Spock's father, former ambassador Sarek, who is near death from the ravages of Bendii Syndrome. In a rare lucid moment, Sarek discloses that Spock has long harbored hopes of peacefully reuniting the Vulcan and Romulan peoples, who once were part of the same civilization. Rather than committing treason, Spock actually may be initiating steps to achieve that peaceful goal. Determined to find the truth, Picard and Data, disguised as Romulans, set out for the Romulan homeworld. Upon finding Spock, Picard learns that the Vulcan is indeed on an unauthorized mission to reunify his people with the Romulans. Spock counts among his allies a Romulan senator named Pardek and the Romulan proconsul Neral. Starfleet Admiral Brackett informs Captain Picard (Patrick Stewart) that Ambassador Spock (Leonard Nimoy) has gone missing and an intelligence scan has placed him on Romulus, raising fears that he may have defected. Picard orders the Enterprise to Vulcan to speak to Spock's ailing father, Sarek (Mark Lenard), with whom Picard shares a close bond. Sarek gives Picard the name of Pardek, a Romulan Senator that he knew Spock had been maintaining a dialogue with for several decades. Lieutenant Commander Data (Brent Spiner) discovers a visual record of Pardek from a trade conference and confirms him as being the figure seen on the intelligence scan of Spock on Romulus. Picard calls in a favor from Chancellor Gowron (Robert O'Reilly), speaking to one of his aides and convincing him to lend them a Klingon ship that could take them to Romulus while cloaked. Picard and Data board the ship, with Picard ordering Riker to investigate the T'Pau and try to find a link to the Romulans. The Enterprise crew find the remains of a decommissioned Vulcan ship, the T'Pau, in the debris of a Ferengi ship which crashed in the Hanolin asteroid belt. On Romulus, Picard and Data (surgically disguised as Romulans) locate the spot where the record of Pardek and Spock was taken, which Data determines is an intelligence bureau building. They wait until Pardek arrives, but when they approach him, they find themselves met by soldiers and taken to an underground cavern. Pardek arrives, explaining that Romulan security knew they were on-planet and they've been brought underground for their safety. Picard states that he is looking for Ambassador Spock, who emerges from a nearby tunnel. Spock demands that Picard leave Romulus, while Picard informs him of the Federation's concern over his "cowboy diplomacy" that he has engaged in, as well as the death of Sarek. Predictably, Spock takes the news of his father's death stoically. He explains to Picard that during the peace negotiations with the Klingons decades earlier (Star Trek VI: The Undiscovered Country), he felt responsible for putting Captain Kirk and his crew at risk. Working alone to avoid similar issues, Spock is now engaged in a "personal mission of peace": the reunification of the Vulcan and Romulan people. He is working with an underground movement to achieve that aim. Pardek has asked Spock to come to Romulus to meet with the new Proconsul of the Romulan Senate, a young idealist who has promised reforms. Picard expresses concern that the willingness of the Romulans may be part of a larger ploy; Spock agrees but points out that if a larger plot is at work, it is best they play out their roles within it to uncover it. 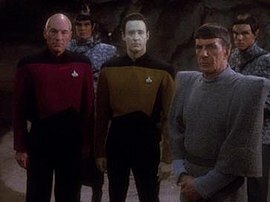 Picard, Data, and Spock are soon captured by Commander Sela, who is planning a Romulan conquest of Vulcan. The stolen Vulcan ship and two others are carrying a Romulan invasion force, under the guise of escorting a peace envoy. Spock refuses to deceive his people by announcing the false news, even after Sela threatens to kill him, and she locks the three in her office and leaves to order the ships on their way. By the time she returns, Data has hacked into the Romulan computer system and created a holographic simulation that distracts her long enough for the three captives to incapacitate her and her officers. Meanwhile, the Enterprise arrives at Galorndon Core, discovering the three Vulcan ships, and moves to block their approach to Vulcan. A medical distress signal comes in - a distraction created by Sela - but as Riker orders the ship toward its source, they receive a broadcast from Romulus in which Spock reveals the true nature of the Vulcan ships. A Romulan Warbird uncloaks, destroys the ships, and recloaks. Riker suspects that the Romulans would rather kill their own troops than allow them to be captured. On Romulus, Data and Picard bid farewell to Spock. The Ambassador is intent upon his goal, realizing that it cannot be achieved through diplomacy or politics. Picard offers Spock a chance to touch what Sarek shared with him, and the two mind-meld. This episode was aired in the weeks before the release of Star Trek VI: The Undiscovered Country. Spock makes reference to the events of the movie when he asks Picard if he was aware of Spock's role in the first peace overtures to the Klingons. Picard is aware of the public history of Spock's role, but not the whole story. Spock says that he forced Captain Kirk to accept the mission, and that he felt responsible for what happened to Kirk and his crew. This time, Spock only wants to risk his own life, which is why he came to Romulus on his own. Leonard Nimoy had previously requested $1 million to cameo in the series, but he took minimum SAG pay to reprise the role of Spock to publicize Star Trek VI: The Undiscovered Country, on which he was executive producer. This episode is one of four times that an original series character reprised his role in The Next Generation; the other three being "Encounter at Farpoint" (DeForest Kelley), "Sarek" (Mark Lenard), and "Relics" (James Doohan). The episode was dedicated to the late Gene Roddenberry, who had died shortly prior to its broadcast. In 2017, Den of Geek included "Unification" as one of their 25 recommended episodes to watch of Star Trek: The Next Generation. A novelization of this episode was published by Pocket Books, it was one of five novelizations to be made of The Next Generation episodes, alongside "Encounter at Farpoint", "Descent", "Relics" , and "All Good Things...". ^ "Star Struck". Entertainment Week. ^ Harvey, Sven (January 29, 2016). "Star Trek: The Next Generation's 25 must-watch episodes". Den of Geek. Archived from the original on January 30, 2016. Retrieved March 11, 2019. Wikiquote has quotations related to: "Unification"